Just back from a quick trip down to Gatwick to see the Gatwick Guest House Association (GGHA). I was invited to give a short presentation on the Together service after a few of their proactive members thought the service may help their website generate more bookings. Like many other associations they need to upgrade their website and in assessing the options it became obvious that a booking engine on the website would be a great benefit…and that’s where Together comes in. Freetobook are always happy to visit groups and explain face-to-face who we are, where we came from and what we do. I was really impressed with the positive and proactive attitude of everyone at the meeting, I was made to me feel very welcome. A big thank you to everyone and especially to Carmel at the Cumberland House for her warm hospitality…..the perfect host. To find out more about how to get together click here. 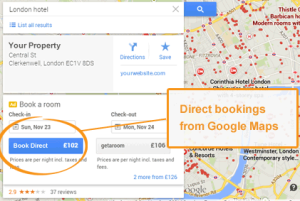 News is out that freetobook are working on a connection which will enable accommodation providers to connect their availability to Google Hotel Price Ads. All customers using freetobook with nightly rates will be able to participate including hotels, apartments, guest houses, inns, bed and breakfasts, hostels, campsites and many others using nightly rates. In the past Google HPA was only available to big hotel chains, Online Travel Agents (OTAs) and digital marketing organisations. Here at freetobook we like to smash through barriers and open up the best marketing technology to everyone, making more distribution channels available on an optional basis to our customers across the world. When completed your freetobook diary will be able to feed rates and availability to the whole of the Google network giving you fantastic global marketing access. This service is on an opt-in basis without any tie-ins so you are free to try it out and calculate your return on advertising investment. Bookings that you receive from the service will be direct bookings and you will be able to pay per click for advertising on the Google HPA service. Google HPA is different from Google Ads. The main difference is that Google HPA can link to your availability and direct bookings can be made there and then. Customers on Google will be able to see which accommodation is available at what price and make a direct booking. Unlike Google Ads you do not bid on keywords with Google HPA the placing of the adverts will depend on Google and their bidding system. Google Local, Google+, and the new Google “three-pack” on AdWords. You can see some of the examples of where the adverts show in the pictures on this blog. 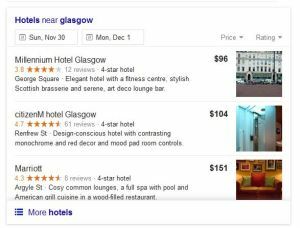 All the best technology changes and improves and Google is a great example of this, so whilst we can say where the Google Hotel Price Ads show now we can also be sure that this will change and improve with time. Customers already using freetobook can pre-register for Google HPA in their TAB”Plus” under “Your Ads” on the orange bar. Is your local association or marketing group doing enough for you? Online booking is just getting easier and more accessible to everyone. It’s great to see associations and marketing groups looking to improve their websites and the profitability of their membership. Local association and marketing group websites tend to generate a lot traffic because they are the best source of local information (search engines like this), but do they really capitalise on all those visitors. If the huge growth of budget hotels and online travel agents is anything to go by you would have to say these local websites are failing to deliver what their members need most…direct commission free bookings. Why are they losing out on these bookings, because they are not offering their visitors what they want…the ability to search availability then compare properties, locations and prices, and make bookings. We all know customers want choice, value and convenience when shopping for accommodation online hence the global popularity of the OTAs. simple and inclusive, the internet booking engine is free to use, quick to set-up (couple of hours) and easy to manage. Members can still run their existing booking systems if they want .. we do not mandate that they have to use freetobook exclusively and there’s no tie-ins. So the cost of entry is just a few hours time for members … a fair price for commission free bookings? Website visitors want to book online on your website and your association or group website, can you and your association afford to sit on your hands and do nothing ?